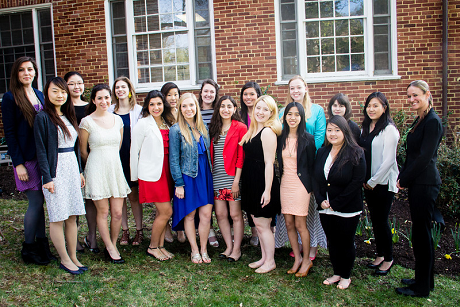 The Elizabeth J. Somers Women's Leadership Program (WLP) is a selective, year-long, living and learning program for freshmen women of any school at GW. WLP preserves the vision of the founder of Mount Vernon College and Seminary, Elizabeth J. Somers, who played an important role in promoting women's education. WLP students have the benefit of small classes, close contact with faculty and women in leadership roles, and strong community ties within the program. Students are a member of one of four academic cohorts and take content-specific courses, humanities, and a writing course with their cohort. The dynamic curriculum emphasizes exploration and development of women's leadership through these academic courses and weekly symposia. WLP symposia feature special lectures, workshops, and experiences that draw on the unique resources of Washington, DC. The weekly symposia allow students to meet and interact with women leaders from many professional fields. Offered exclusively at the Mount Vernon Campus, WLP students live with their respective cohorts in Somers Hall. Additionally, a graduate teaching assistant, who serves as a mentor and academic resource, lives with each cohort.